WORKPLACEProviding world-class customer service in the workplace can be elusive for many employees. How do I become a superstar in my job? How do I know what my customers expect from me, from my company? How can I always provide superior customer service? 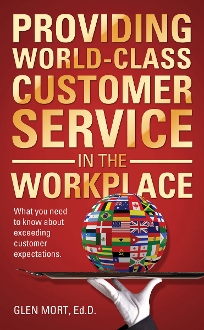 All these and many more questions are answered by Dr. Glen R. Mort as he reveals the secrets to consistently providing world-class customer service in the workplace and what you need to know about exceeding customers’ expectations. Dr. Mort shares his twenty-five years’ experience as a human resources and educational professional and provides the reader with simple yet effective techniques that guide the reader to achieve the end result of providing a positive experience in any work setting.